Alexey Leonov became the first man to walk in space, and later went on to take another historic step: the famous US-Russian handshake in space. Leonov made friends with a US astronaut on that mission, and the close bond has continued through the years. Ten years after Leonov’s historic spacewalk, he went on a joint space mission with US astronaut Tom Stafford. This initiated a close friendship, and a symbolic one: their handshake in space was a sign to many that the Soviet Union and the US could deal with the issues between them. “It was a demonstration to the whole world that two countries with different languages, different units of measurements, and certainly, greatly different political systems, could work together for a common goal,” Tom Stafford told RT’s Gayane Chichakyan, who visited his Florida home. Before their mission together, in 1975, Stafford and Leonov planted a tree in Star City, in Russia. However, their friendship went far beyond the final frontier. 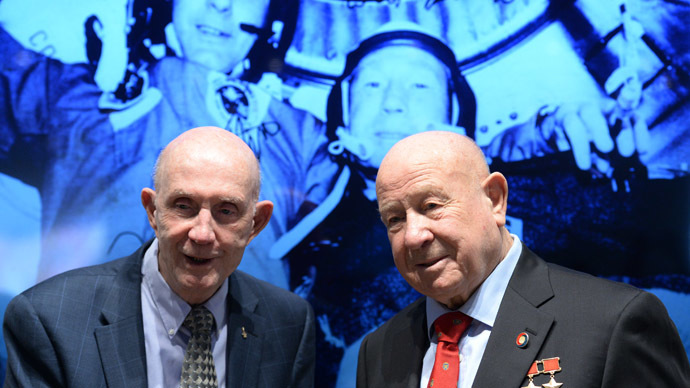 Some years ago, Alexey Leonov helped the Staffords to adopt two Russian boys. “I lived in Russia, and I got to know the Russian people. I knew the characteristics, and I wanted two Russian sons. And it’s worked out great,” Stafford said. Stafford’s youngest son, Stas, is now 20 years old, and the elder son Michael went to Russia to study at a company where Alexey Leonov is the boss. “His [Leonov’s] granddaughter is named after my daughter, and my grandson’s middle name is Alexey, named after him. We’re very close friends, we’re like brothers,” Stafford said. George Abbey, former director of the Johnson Space Center and Fellow in Space Policy at the Baker Institute of Rice University, and a fierce defendant of all Russian-US cooperation in space, even during the Cold War, has told RT that cosmonauts and astronauts have always managed to put politics aside. “I think we’ve been very good so far in keeping space away from the politics, and we have an excellent relationship with our Russian colleagues on the ISS, and we share a common goal and a common vision,” Abbey said. “Hopefully, we will continue to do that, as it might set an example of how we can work together here on the Earth, because we work very well together in space,” he added. Follow RT’s special coverage of the milestone space walk: a live feed from Moscow Museum of Cosmonautics featuring Leonov himself. RT will also follow questions posted under hashtags #askacosmonaut or #спросикосмонавта, and those under RT’s Facebook post, and ask Leonov to answer some of them.